We transformed a tired 1960's shower into a roomy and luxurious hotspot. It’s the perfect location, it’s the perfect ranch house, and it’s the perfect yard. BUT: it’s also a 1960’s master bathroom in that strange pinky color. The shower is a walled-in, claustrophobic booth, dimly lit, with a low ceiling and obscure shower glass. Not to mention the worn-out grout that no matter how hard you scrub, it never looks clean! How do we bring the master bath into the 21st century? Imagine it feeling luxuriously spacious and bright; appearing glistening clean and easy to keep that way—no longer the dated pink, but the colors of sand and water and sunshine. The sprayer sends out a vigorous stream of ample hot water. It might even have multiple showerheads and a hand-held sprayer. In fact, a great shower is one of life’s pure pleasures, daily sensual enjoyment. How do we get from a weary 1960's shower to a first class 2009 shower? Modern tastes value the large master bathroom, but this existing bathroom was limited to a tiny footprint. Why not steal some space from the adjacent hall bathroom that had room to spare? Now the shower could expand to a size worthy of a master suite. 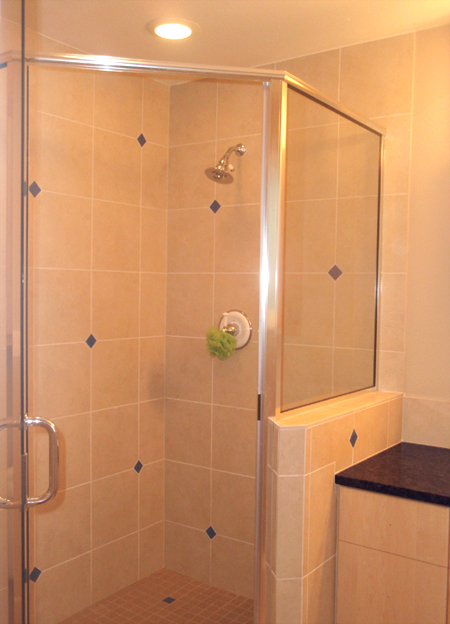 To create an even bigger illusion of space, we traded in the tile walls for clear shower glass to allow light in. (By the way, shower glass is much less expensive than tile.) Now, instead of staring at dim shower walls, the eyes can rest on the lovely new vanity with the durable easy-to-clean granite countertop, and the sparkling new polished chrome faucet. Every once in a while the eye will catch a sparkle of blue crystal embedded in the granite slab that picks up on the watery blue tile accent dots in the shower. How perfect! So now, after all the work is completed, the perfect ranch house in the perfect location with the perfect yard has the perfect master bath! Life is good.